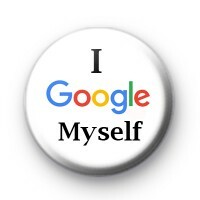 Simple white badge with the text I Google Myself. Have you ever typed your name in to Google to see if you exist online, I bet you have. If not try is and see what comes up in the search results. This badge is suited to all the computer geeks out there, we all know one.